Could we like, really do it? We can you know? Beyond our stupendously beautiful jerseys, there is actual quality in this Super Eagles generation. This has more than just a few people (including me) optimistic that if they could just channel the winning spirit of their predecessors, they could go on to make history in Russia. We don’t even need to win all our matches. Only Brazil in 2002 and 1970 have ever done so. All we need is six wins and these six wins from our past World Cups would be perfect. Winning our first game at the World Cup is extremely important. For various reasons. Top of that list is that only three of the 20 past winners of the World Cup have failed to win their first games, only one of them lost. Also, Nigeria has fared a lot better after winning their first group game, qualifying from the group stage every time they won their first game and failing to qualify two of the three times they didn’t rack up initial wins. A healthy victory over Croatia in our first match would be key, a healthy victory such as the one against Greece at our first ever World Cup. 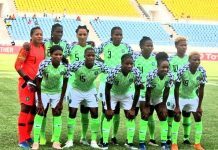 Nigeria entered that game on a low after losing to Argentina, but they never let it show, they exuded confidence and were on the front foot before finally opening the scoring just before halftime. Finidi George latched on to an Emmanuel Amunike pass and executed an immaculate lob. Queue one of many iconic Nigerian celebrations at the World Cup. 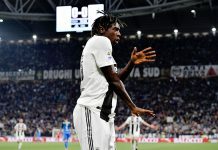 The victory was confirmed late on with one of the goals of the tournament by Daniel Amokachi as he skipped past four players like a prized horse before unleashing a thunderous shot into the top corner to make it 2-0 in second half of stoppage time. 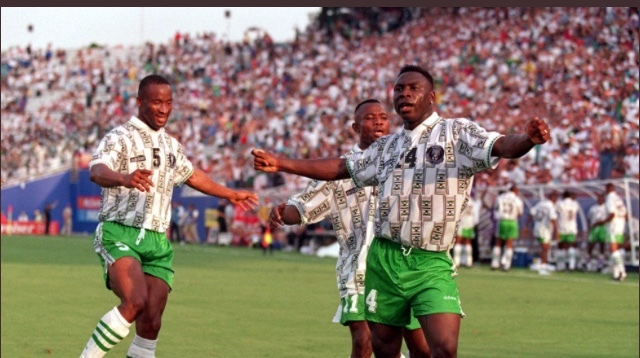 Amokachi had earlier assured victory to secure qualification in ‘94, it would also be a perfect victory to kickstart a victorious World Cup campaign. On to the second match against a very sturdy and disciplined Iceland team, but even they are capable of taking their eyes off the ball occasionally, like when they lost by as much as 5-2 against France at the Euros in 2016. A victory like that with a comfortable goal difference could be essential for qualification as Nigeria found out at the Under 17 World Cup in Finland when Nigeria finished level on points, goal difference and discipline with Costa Rica in the group stage. Qualification from the group then went to the drawing of lots and Nigeria lost. Luckily Nigeria has such a win in their coffers. Not just any victory, but a historic one. 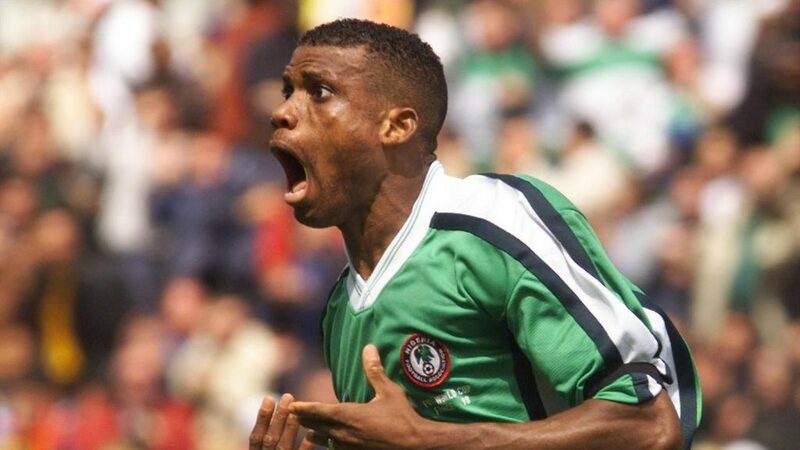 The first ever Nigerian win at the World Cup. 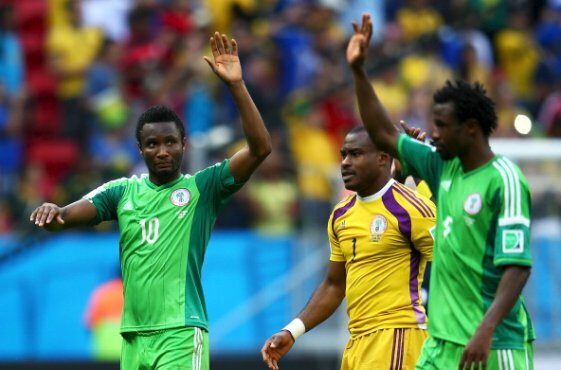 An eventful 3-0 victory over Bulgaria which announced Nigeria to the World. 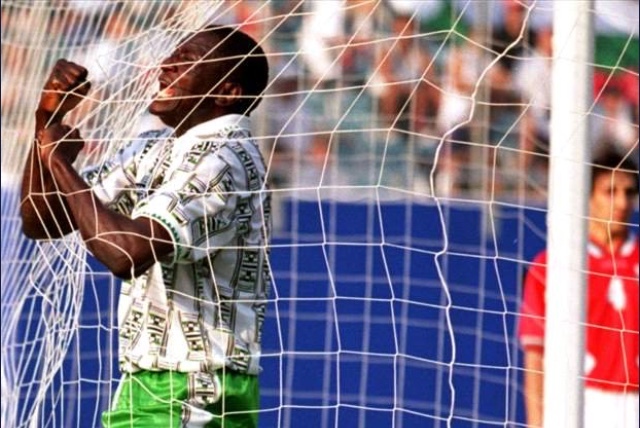 Goals from Rashidi Yekini, Amokachi and Amunike propelled Nigeria to a perfect start to life on the biggest stage. If the ice-cold Vikings let their guard down, there’s every chance that Odion Ighalo, Victor Moses and Alex Iwobi can run riot against them. 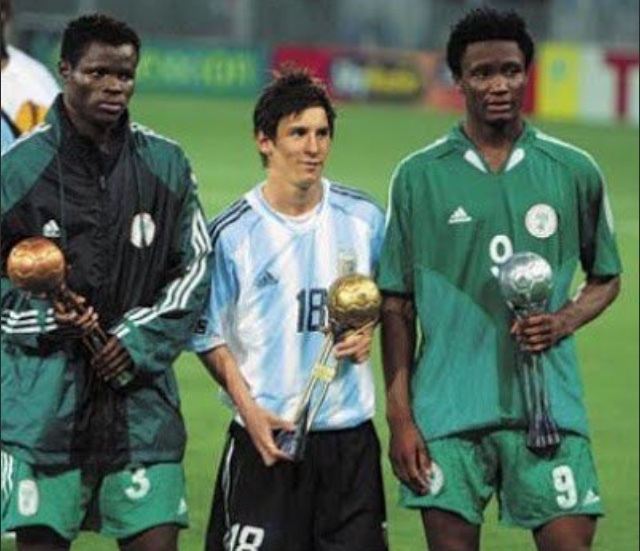 Nigeria has faced Argentina an incredible five times at the World Cup, what is more incredible is they have lost every time. Luckily, it’s never been by a significant enough margin. So, if we can keep it down to just the one goal margin that we’ve maintained against Argentina, the avalanche of goals scored in the first 2 games should be enough to see us through to the next round on our journey to an unprecedented World Cup triumph in Russia. To win a World Cup takes hard work, discipline, expertise and of course some good ol’ luck. Germany might not have played any penalties on their way to winning the World Cup in 2014, but they have benefited the most times from penalty shootout situations since it took effect in the World Cup in 1982. But it isn’t just Germany that has benefited from penalty shootouts to get wins at the World Cup with four of the nine winners since then requiring the lottery of penalties at some point during their title wins. Only two finals-2002 and 2010- have featured sides who did not partake in a penalty shootout throughout the tournament. Thus, it may not be such a bad idea to have one dramatic penalty shootout for Nigerians I savour in our imagined run up to glory in Russia. The boys don’t have a World Cup win on penalties under their belt yet, so I’ve borrowed one of my favourite penalty shootouts involving Nigeria from the 2005 U-20 World Cup. Nigeria came up against the host nation Holland in the quarterfinal after the Dutch had mowed down everybody in their path up to that point, finishing the group stages with a perfect nine points, conceding only one goal in the process before beating Chile 3-0 in the second round. Nigeria was not intimidated by the large Oranje crowd that came to support the home nation or by the daunting reputation that Ryan Babel, Quincy Owusu Abeyie and co had built for themselves as the tournament progressed. They took the lead within a minute of play. John Owoeri with a lung-busting run down the flank and an awkward finish gave Nigeria the lead but a Ron Vlaar goal barely 15 minutes later restored parity and it remained that way through extra time and 22 penalties before a miss by Collins John with Netherlands’ 12th try was punished by Taye Taiwo converting for Nigeria to give them a 10-9 victory on penalties. Dramatic eh? Only the best for my country and its wins. Knockout games at international tournaments don’t require too many goals to win, a simple 1-0 win is all it takes and Nigeria, of course, have proven that they can produce the odd goal victory. The one that immediately comes to mind is one from France 98, in a very tight affair against Bulgaria. 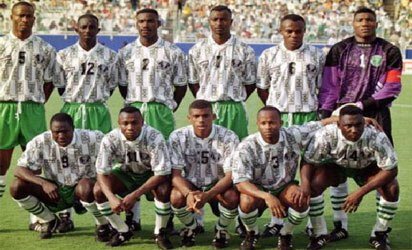 Weary of the Super Eagles after the hammering in 1994, Bulgaria went after them with a more measured approach but it ultimately ended in a victory for Nigeria as Victor Ikpeba found a way through to their defence to secure a 1-0 win with a brilliant goal. Flooring a defender superbly before sneaking the ball under the goalkeeper. A goal worth winning a Quarterfinal if I do say so myself. For the semifinal match, I’ve gone for Nigeria’s win over Bosnia in the 2014 World Cup which helped them qualify for the second round. The key match of the group would have felt like a knockout game for Nigeria who had already failed to pick up maximum points against group whooping boys Iran and still had a daunting tie against Argentina to come. It was what we call in Nigeria a do or die affair and the Super Eagles were determined to stay alive in Brazil. They survived a barrage of assault from the Bosnians with Miralem Pjanic and Edin Dzeko spearheading the affront to score a goal that shouts “semi-final goal”. A rough, rugged run into the box by Emmanuel Emenike produced a cross into the box which was met by Osaze Odemwingie. Nigeria doggedly held on for all three points and secured qualification despite losing their final group game to Argentina. Any keen follower of Nigerian football history would already know the match I’ve meticulously saved for the final, and who could blame me really. The most memorable match in Nigerian World Cup history would be the ideal final for the passionate drama crazed Nigerian populace. We deserve no less. If you haven’t figured it out by now, I’m referring to our melodramatic cardiac arrhythmia-inducing 3-2 win over Spain at the 1998 World Cup. In true Nigerian fashion, the Super Eagles are from behind not once but twice to shock the Spanish and indeed the whole world. Spain took the lead through Fernando Hierro but got quickly pegged back by Mutiu Adepoju’s brilliant goal. They went back in front when Hierro’s Madrid teammate Raul scored just after halftime. Nigeria equalized when Andoni Zubizarreta turned a cross from the left flank into his own net setting up the perfect situation for Sunday Oliseh to score one of if not THE greatest goals in Nigerian football history. 20 years later, it would be magical if the 2018 team could celebrate the anniversary of that shock with an even bigger shock by lifting the World Cup with the right amount of wins.